is abundant with good weather, beer and active people but is not usually the first city that springs to mind with bike friendliness. Take heart because what is lacking in infrastructure is made up in attitude and we see this city's progressive bike plan making them one day the United States' most formitable contender for bike tourism. 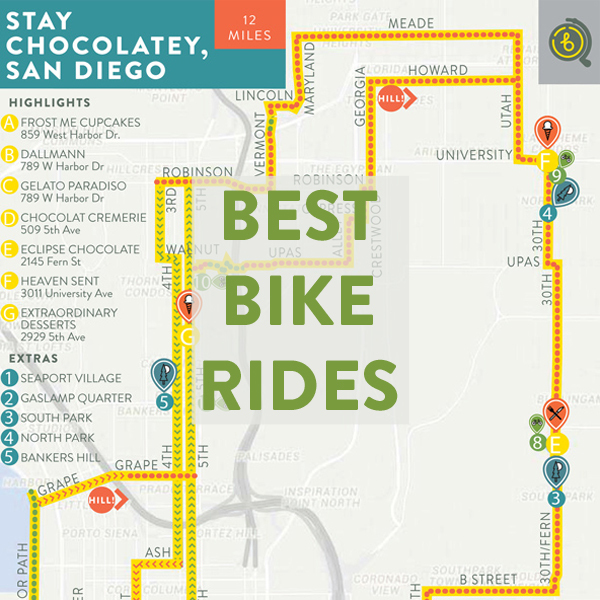 Bikabout's city guide has riding tips, routes curated by locals, and logistical resources you'll need to wander San Diego by bike. For those of you who still somehow require further convincing, SD also has $100M in dedicated funding for protected bike lanes, it has stunning weather by even "southern France" standards, it has a delightfully pervasive outdoor culture, and it has tons of active residents doing what you'll be doing. The food is fresh and healthy, the beach is endless, and the sun sets right into the ocean... that's exciting for people from the east coast. The strong conservative military subculture has somewhat limited the usual "California Weird" factor, but it's still a much more refreshing place to eat, drink, and be than anything most other states can offer. It's an easy place to fall in love with. This is an extremely active city with tons of runners, walkers, stroller runners, and carbon fiber roadies sharing the space, so make sure to use hand signals on paths as well as your bell to be polite when overtaking someone. Feel free to ride on the sidewalk if you feel uncomfortable, but walk your bike if there are "no biking" signs, or if there's a crowd. Helmets are the law for riders under 18 years old. Music ear buds can be worn in only one ear. For night time riding, bikes must be equipped with reflectors on the pedals and wheels, with a red reflector on the rear. Additionally, you must have a front white light. Mission and Coronado beaches have high theft, most likely from the laid back, "hey bra - no need to lock" cruiser culture, which means that just by using a lock, you're already ahead. Downtown is also a hotspot for theft, but the neighborhoods have lower theft rates. A sturdy u-lock on a real bike rack is probably fine, and always bring your bike inside at night unless absolutely impossible. Being a strong tourist destination, San Diego has a fairly diverse array of riders on display... Cruiser bikes dominating the beach scene, commuters enjoying their ride from Point A to Point B, roadies on drop bars burning calories and DecoBike tourists soaking it all in at their own slow pace. This route is a great way to see so many of the parts of San Diego that make it the place I have chosen to live and to enjoy some of the city's best food, sights and roads. All within easy cruising distance of the mid city area. Coffee Hub and Cafe, a bike-centric eatery and espresso bar, is a project of the Sandy Hanshaw, better half of Andy, Director of Sand Diego County Bike Coalition. Balboa Park's grand entrance to museums like the Museum of Man and Museum of Art. 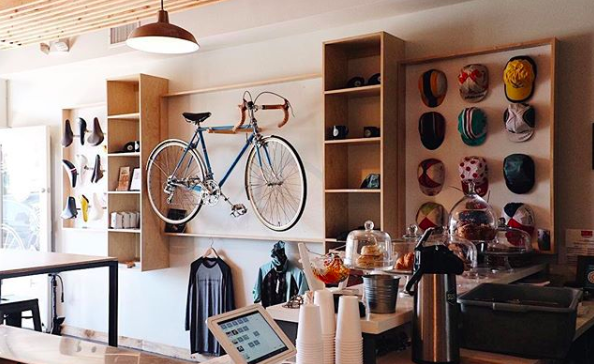 We're constantly updating this list of our favorite bike shops, coffee shops, restaurants, museums, scenic vistas, playgrounds, ice cream joints, microbreweries and more in San Diego. The Pearl Hotel has complimentary beach cruisers for guests to borrow. Follow Bikabout's board Bikabout San Diego Airbnbs on Pinterest. 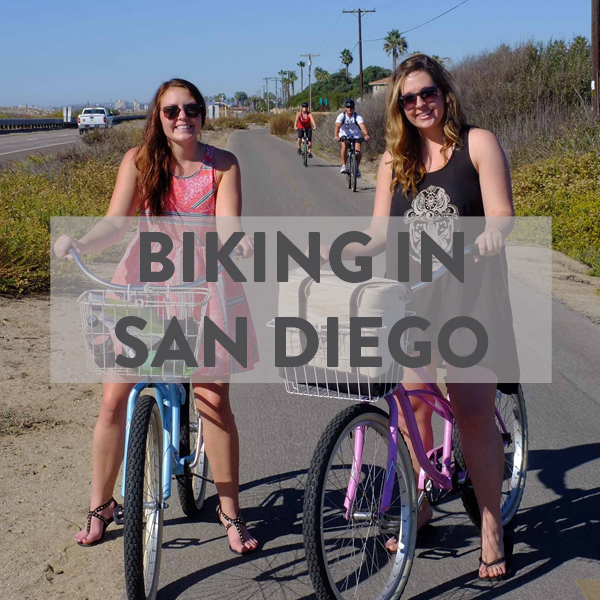 Bike friendly ferries will take you from downtown San Diego to Coronado. Coronado Ferry - $4.75 one way (bikes free) from Broadway Pier or the Convention Center to Coronado Ferry Landing. Pacific Surfliner (San Luis Obispo - Santa Barbara - Los Angeles - San Diego) - Make a reservation for free bicycle roll-on service. "To get a closer look, you'd have to be on a surfboard, which, believe it or not, you're welcome to bring onboard, since the Pacific Surfliner has special racks to accommodate the bikes and boards of our more outdoor-minded riders." Bikabout donates 25% of annual revenue to local advocates. You, too, can power better biking in San Diego by becoming a member of San Diego County Bike Coalition!